Wooden incense stand with jaali (net ) work and brass elephant work on it. This is a running products and we have 3 sizes available on it and some more beautiful designs. 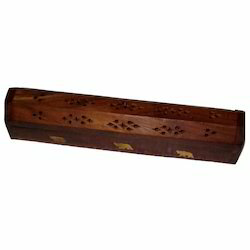 wooden incense stand available in each sizes. Our range of Incense Stick Holder, is available in different shapes, sizes and designs that are as per the client’s preferences. Spreading the freshness and fragrance of these incense sticks, these incense stick holder, incense sticks burner are beautifully crafted. We manufacture & supply a wide variety of Incense Stick Burners available in many designs & sizes. Incense Holder also known as Wooden Towers..
We are the leading Manufacture supplier exporter of Wooden Incence Burner and offer this product as per client requirments and product available various colour and quality and i am looking For Foreign query with bulk order . The wooden incense holder jali offered by us are available in different shapes and sizes to Incense Stick Holders of varying sizes. 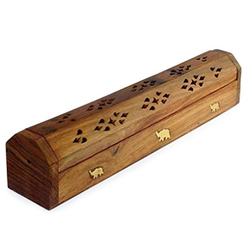 These holders are beautifully crafted and are specifically designed to hold incense sticks. We offer a wide range on incense holder in brass, aluminum & wood. Brown Wooden Incense Holder, Size/Dimension: 4"
With the help of this Wooden incense holder, you can light incense and keep it anywhere freely. DIMENSION : 3", 3.5", 4.5"
As a quality focused firm, we are engaged in offering a high quality range of Wooden Incense Cone Holder. Here we offer the wooden incense sticks holders.